Nashville, Tenn….June 16, 2010 - For the past month Gibson Guitar and the Gibson Foundation have placed Music City Flood Relief Donation Banks throughout Nashville at landmark venues and businesses to help aid the victims of the recent Nashville floods. 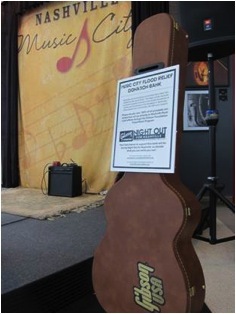 The donation banks created from actual Gibson guitar cases have been placed throughout the city for visiting patrons to make a donation to help aid the thousands of people who have been left homeless and without the basic necessities of everyday life. 100% of all proceeds will benefit the flood victims in Nashville and surrounding affected areas. On Friday, June 18, a final push to raise funds for the banks will be conducted through the citywide event “Night Out for Nashville” – An Evening for Music City Flood Relief. All participating businesses and venues with donation banks will rally this day and night to host simultaneous final encouragements for donations to be made to the guitar banks. Music events and special incentives, including the addition of the John Lennon Educational Tour Bus onsite at the Hard Rock Café for public tours throughout the day, will encompass the close of this evening with all donations made to the guitar case banks going directly to the Gibson Foundation Flood Relief Programs. Beginning at Noon on Friday, June 18, the John Lennon Educational Tour Bus will be stationed in front of the Hard Rock Café and will be open for public tours. The Lennon Bus a non-profit state-of-the-art mobile Pro Audio and HD video recording facility that provides hands-on experiences for students of all ages. As part of the flood relief effort, the Lennon Bus will be hosting a silent auction on site at the Hard Rock Café of an Epiphone acoustic guitar signed by the Black Eyed Peas. 100% of the proceeds from this auction will also go to the Gibson Foundation’s Flood Relief efforts. Furthering their support, in conjunction with The School of Audio Engineering (SAE) Institute in Nashville, The John Lennon Educational Tour Bus will also be announcing the establishment of the Dan Brown Memorial Scholarship. Dan Brown was a promising student and aspiring musician and engineer at SAE Nashville who lost his life in the 2010 Nashville flooding. In his memory, SAE is offering one full scholarship to a deserving student. Eligibility will be based on both need and merit and administered by SAE Institute in association with the John Lennon Educational Tour Bus. Night Out for Nashville is supported by Gibson Foundation, Nashville Convention & Visitors Bureau, Next BIG Nashville, American Songwriter Magazine, Lightning 100, and the John Lennon Educational Tour Bus. For more information on “Night Out for Nashville” please go to http://www.gibson.com/nightoutfornashville. The John Lennon Educational Tour Bus is a non-profit state-of-the-art mobile Pro Audio and HD video recording facility that provides hands-on experiences for students of all ages. In its 12th year of touring, the venture is proud of its brand new bus and its studios, which boast the latest audio and video technology, gear and products. The concept began as an offshoot of the John Lennon Songwriting Contest, which is dedicated to providing opportunities for both professional and amateur songwriters around the world. The Bus travels across the U.S. and Canada year-round, providing free tours and workshops at schools, retailers, festivals, on tours with headlining artists, and at major industry conferences. The Bus, a 501(c)(3) venture, is made possible through the generosity of sponsors including Apple, Maxell Corporation, NAMM, The Beatles: Rock Band, Gibson, Epiphone, Sony, Avid, Roland, Mackie, GHS Strings, Sonicbids, Disc Makers, Edirol by Roland, Blackheart Amps, Ampeg, Boss, Digital Media Academy, Aphex Systems, Audio-Technica, Glyph Technologies, Neutrik, Music Player Network, Propellerhead, Musician’s Friend, Harris Corporation, Ableton, Apogee, Litepanels, Applied Acoustics Systems, Antares, McDSP, IK Multimedia, Native Instruments, Slingerland Drums, Bogen Imaging, and Noise Industries. The John Lennon Educational Tour Bus is made possible by an agreement with Yoko Ono Lennon. Gibson is known worldwide for producing classic models in every major style of fretted instrument, including acoustic and electric guitars, mandolins, and banjos. The Gibson Les Paul guitar is the best selling guitar of all time and bears the name of the late, great Les Paul. Gibson’s HD.6X-PRO Digital Guitar, the Gibson Robot Guitar , the Gibson’s Dark Fire and the Gibson Dusk Tiger represent the biggest advances in electric guitar design in over 70 years. The Gibson Foundation is the philanthropic arm of the Gibson Guitar Corp., and dedicates its time and services to making the place a better world for children through its support of music, education, health and human services. Founded in 1894 in Kalamazoo , Michigan , and headquartered in Nashville since 1984, Gibson Guitar Corp.’s family of brands now includes Epiphone, Dobro, Kramer, Steinberger, Tobias, Echoplex, Electar, Flatiron, Slingerland, Valley Arts, Maestro, Oberheim, Baldwin, Sunshine Piano, Take Anywhere Technology, J&C Fischer, Chickering, Hamilton, and Wurlitzer. Visit Gibson’s website at http://www.gibson.com. Follow Gibson Guitar at http://www.twitter/gibsonlifestyle or http://www.facebook/gibsonguitar.